Baku Higher Oil School ( BHOS ) hosted a workshop entitled 'New generations and the new world of learning'. It was conducted with financial and organizational support from SOCAR Turkey company for the Higher School professors, teachers and administration staff members. 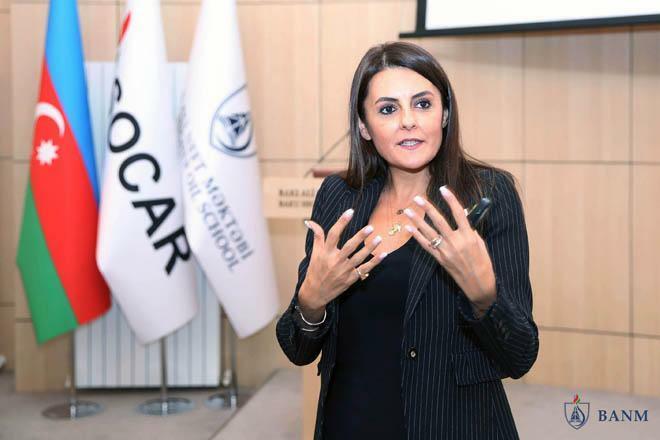 The workshop was also attended by a group of the company representatives led by Head of HR, Group Director at SOCAR Turkey Sibel Uğur. Opening the gathering, BHOS Rector Elmar Gasimov expressed his gratitude to the SOCAR Turkey management and to Sibel Uğur personally for the continuous support and the assistance in organizing the workshop. In her turn, SOCAR Turkey HR Director spoke about fruitful cooperation between BHOS and the company. Sibel Uğur emphasized that this workshop should contribute to make the teaching process more effective and more attractive for the young generation. The presentation on the workshop subject was conducted be well-known Turkish expert Evrim Kuran. The speaker highlighted, among others, relations between teaching and learning generations at work place; the role of training in developing expertise in a world, which experiences rising levels of skills shortage; and new paradigms of learning for new generations. Special attention was paid to digital context in relation to how Generations Y and Z learn; motivation, appraisals and feedbacks at the workplace for Generation Y; and readiness of the society for Generation Z. The presentation was followed by a discussion, exchange of views, and question and answer session. Evrim Kuran has worked with many local and global employer brands in various industries. She co-founded Dinamo Consulting in 2006 and has been working on generational studies and employer branding ever since. She is the Middle East Director of Universum, the world's leading employer branding research and consulting company. Evrim Kuran is also the creator and the curator of the region's biggest employer branding conference, People Make the Brand since 2013, and the author of the book Telgraftan Tablete (From Telegram to Tablet).